Peppered Snails are a common feature in Nigerian restaurants' menus. They are also served as Small Chops at parties. 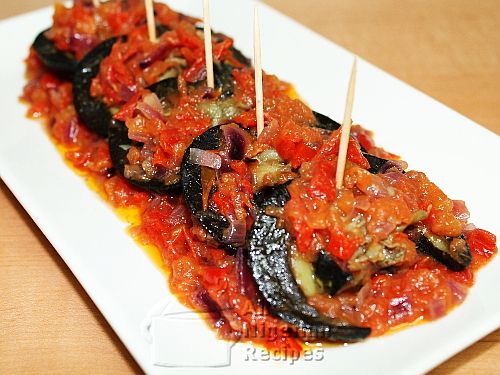 With Peppered Snails, you need to mind the pepper! It is so easy to prepare Peppered Snails. All the hard work goes to cleaning the snails, once you are done with that, the rest of the preparation is very easy. Be careful about the quantity of seasoning you add to snails. They can easily get over-seasoned and taste salty because due to the texture of the meat, it does not absorb much of the seasoning. You can skip the tomatoes and use only habanero peppers. But you will need lots of peppers to make enough stew for the snails, that means the Peppered Snails will be too spicy hot and all you can taste is the pepper. Not good. Break the shells of the snails and clean the snail slime. Cut half of the first onion into big chunks. Cut the other half into tiny pieces. 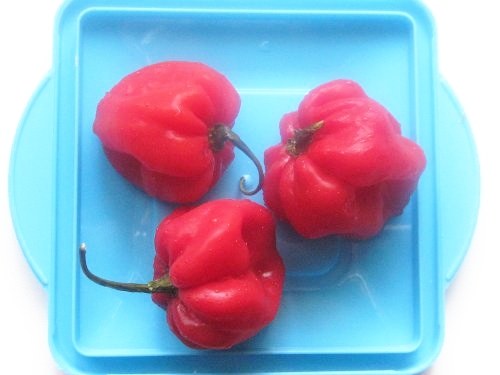 Cut the habanero peppers (scotch bonnet) into tiny pieces. Remove the seeds from the tomatoes and cut them into thin slices. Put the cleaned snails in a pot and pour water to cover them. Add the stock cube and the chunks of onion. I use chunks of onion when I want to season with onions without having pieces of onions in what I am cooking. Cover and start cooking on medium heat. While cooking, top up the water when necessary so it does not burn. Put the sliced tomatoes, pepper and onions in another pot and start cooking on medium heat. The aim is to steam them till they are soft. Stir from time to time so it does not burn. After 30 minutes, the snails should be well cooked. Remember to top up the water as you cook them. Note that the tongue of the snails are still crunchy even when the snails are done. Remove the chunks of onion from the snails. Increase the heat to high and stir constantly till all the remaining liquid in the pot is absorbed. You don't want to lose any flavour by pouring away the snail stock. Set it aside. When the water dries from the pepper, tomatoes and onions, add the vegetable oil and fry for about 5 minutes. Stir continuously so it does not stick to the pot. Add the cooked snail. Stir very well and add more salt if necessary. That's it! Leave to cool down a bit, insert toothpicks and serve with onions. If you are entertaining guests or having dinner with the family, serve it as a side dish to Fried Plantains or Jollof Rice. You can also serve them with a chilled drink. For parties, serve as Small Chops.